"I'm looking for a free program that I can convert DVD to MP4 format for storing on my external hard drive. Most of people suggest me to use Handbrake to rip DVD, but I really don't know how to operate it. Is there any simple Handbrake DVD to MP4 tutorial on the internet or any other helpful suggestions? Thanks in advance." Frankly, a majority of experienced users will rely on Handbrake to rip DVD to MP4 since Handbrake is a free and open-source video transcoder. Of course, Handbrake is able to freely convert DVD disc and ISO image to MKV and MP4 for compatible with iPod, iPhone, iPad, AppleTV, Android phones/tablets, etc. 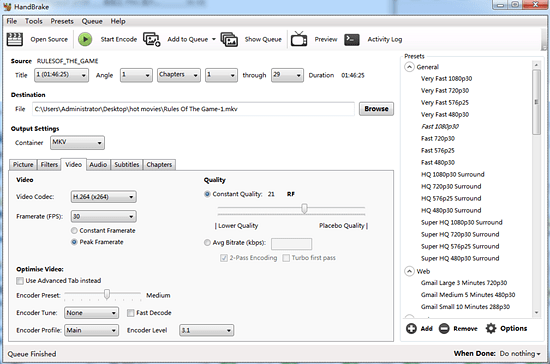 And in the process of Handbrake DVD to MP4, users are allowed to customise the output video parameters like bit rate, maximum file size, sample rate, etc. Next, we take a look at how to convert DVD to MP4 with Handbrake. 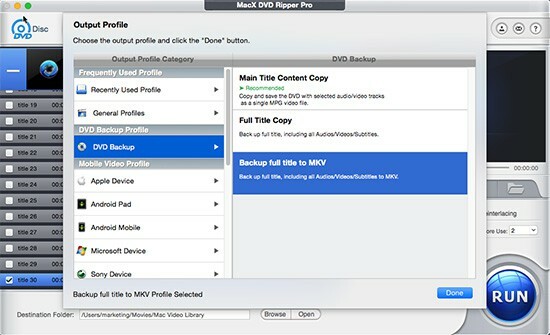 Try to use the best Handbrake alternative - MacX DVD Ripper Pro to rip any latest released DVDs, 99-title DVDs, damaged DVDs and even knotty discs unplayable MP4 MKV MOV AVI for any device. No crash or mixed up files. As is known to all, Handbrake can't handle any copy-protected DVD. But, the nice thing is that you also can use Handbrake to rip DVDs encrypted by CSS and region code with the help of Libdvdcss. Actually, Libdvdcss is a necessary factor for some DVD rippers that don't have the DVD decryption ability like Handbrake to easily access to the encrypted DVD. After installing Libdvdcss on Mac/PC, users can painlessly apply Handbrake to convert CSS copy-protected and region code blocked DVD to MP4. Then, follow the below steps to begin Handbrake DVD rip. Step 1: Download and install Handbrake. Go to Handbrake homepage to download the latest Handbrake 1.0.3 on your computer. If your are a Mac user, you can download Handbrake for Mac; you can download Windows version of Handbrake if you are a Windows user. Step 2: Load DVD movie. Fire up Handbrake and click "Source" button on the left. Then select "Open Folder" option to load DVD movie from computer hard drive. Certainly, you also can load DVD movie from disc by inserting DVD disc to computer DVD drive at first. Note: To avoid of only ripping a section of DVD content like the preview or the DVD menu, you should choose the longest duration in the list under "Source" section. Commonly, Handbrake will automatically choose the main movie. Hit "Browse" icon to choose a destionation folder to save your converted DVD video file. Step 4: Set MP4 as the Output Format. Feel free to choose MP4 as your desired output format under "Output Settings" section. Correspondingly, you can choose MKV if you wanna convert DVD to MKV with Handbrake. Step 5: Start Handbrake DVD to MP4 conversion. Tap "Start" button on the top to start to convert DVD to MP4 Handbrake. According to our test, Handbrake took 42min to convert THOR DVD (115min) to a MP4 video with 855.2M. Generally speaking, the conversion time largely depends on your computer configuration, file size, output video settings and more. Beyond doubt, Handbrake DVD to MP4 converter free could be your best assistant in most time. But, users also come across all kinds of Handbrake not working issues when using Handbrake to convert DVD to MP4. You can check the below Handbrake problems and find out solutions. Q: My kid tried to use Handbrake DVD decrypter to convert DVD to MP4 for playback without limits. But, it said "No valid source found." A: Probably your inserted DVD is damaged/scratched or copyright protected. Try to find another functional DVD ripper to deal with unplayable, damaged and encrypted DVDs. Q: Handbrake gives me an error message of "No Titles Found" when I rip DVD to MP4 using Handbrake. A: Your Handbrake is corrupted or your DVD is copy protected. Try to redownload and install Handbrake on your computer. Q: My Handbrake can't scan DVD title correctly and sometimes it will prompt me a reading error. A: The main cause of Handbrake reading error in DVD ripping process is DVD copy protection. Besides, you may come across Handbrake no title found issue, Handbrake cannot rip 99 title DVD problem, etc. especially when you rip DVD published by Disney Studio or Warner Studios. In general, most of Handbrake DVD to MP4 errors are mainly caused by DVD copy protection tech and Handbrake isn't able to deal with such kind of issues for now. To solve this problem, you may have to figure to a functional DVD to MP4 Handbrake alternative. Serving as the best Handbrake alternative, MacX DVD Ripper Pro is an expert in DVD ripping. To be specific, this DVD ripper supports ripping all types of new DVDs, 99-title DVDs, TV series DVDs, workout DVDs, Japanese DVDs, unplayable or damaged DVDs and other DVDs to MP4, H.264, MOV, M4V, QT, AVI, MPEG, FLV, MP3, to name just a few. In the process of DVD converting, it can automatically choose the correct title thanks to its unique DVD title check mechanism. What's more, this topmost Handbrake DVD ripper alternative is capable of ripping DVD to MP4 H.264 video in 5 minutes due to its advanced hardware acceleration tech. Ahead of converting DVD to MP4, users need download Handbrake alternative on your Mac computer (macOS Mojave included); you need download Windows version (Win 10 supported) if necessary. Next, follow the below guide. Step 1: Launch this DVD to MP4 ripper and click "DVD Disc" button to load DVD content after you insert the DVD. DVD ISO image or Video_TS folder also can be loaded by clicking "ISO image" or "Path" button. Step 2: Select MP4 as the output video format from "General Profiles" list. Of course, if you wanna rip DVD to AVI, MOV, M4V, etc, you just need scroll down to choose your desired video format. Step 3: Hit the "Browse" button to choose the output folder to save the converted video file. Step 4: Click the "RUN" button to start DVD to MP4 conversion. Wondering the best Handbrake settings to rip DVD discs to iPhone iPad? This Handbrake tutorial will tell you how to preset Handbrake for your iPad iPhone during DVD ripping while getting the best quality and smallest size. Handbrake won't rip DVD movies fixed: Handbrake troubleshooting here provides solutions to Handbrake can't rip DVD movies with copy protections, Handbrake won't rip whole movie DVD, other errors on macOS Mojave/Windows 10.